New York Gov. 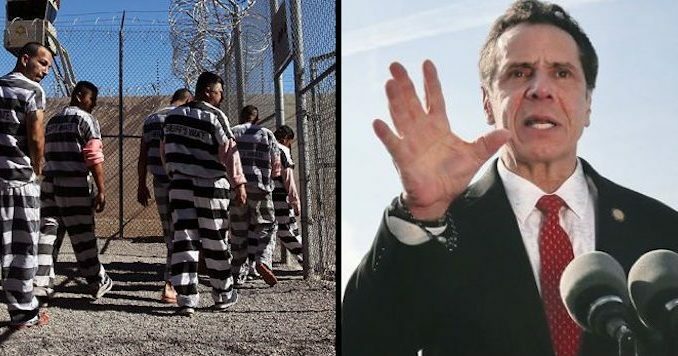 Andrew Cuomo has pardoned four illegal immigrants imprisoned for murder, in retaliation against President Trump’s border security feud with the Democrats. In a New Year’s Eve statement, Cuomo slammed Trump for the partial government shutdown and boasted that he had granted clemency to 29 people, including dangerous immigrants who were facing deportation. “While President Trump shuts down the federal government over his obsession with keeping immigrants out, New York stands strong in our support for immigrant communities,” Cuomo said. Washingtonexaminer.com reports: Twenty-two of the individuals who received pardons were immigrants who, because of convictions mainly related to drug crimes, could have been deported. Among the seven others who had their sentences commuted are four convicted murderers and three others behind bars for armed robbery. Cuomo will be sworn in for a third term on Tuesday on Ellis Island, which for about 60 years until 1954 processed millions of immigrants entering the U.S.